FUEDI is the European Federation of Loss Adjusting Experts and includes member associations from fifteen European countries. the CILA providing European guidance on GDPR to the FUEDI General Assembly. Over the next year, Malcolm’s priorities will be to robustly benchmark qualifications of member associations, secure mutual recognition of qualifications post Brexit and enhance the dissemination of all technical output from FUEDI. CILA Associates and Fellows are entitled to use the designation FUEDI-ELAE, a qualification mark recognised throughout Europe. Malcolm’s appointment has been recognised by Lord Henley, Parliamentary Under Secretary of State (Department for Business, Energy & Industrial Strategy) and Steve Baker MP, Parliamentary Under Secretary of State (Department for Exiting the European Union) who passed on their congratulations having been informed by Sir Nicholas Soames MP. 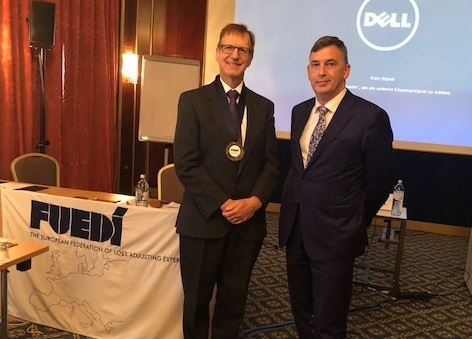 In May 2019 the FUEDI General Assembly meeting will take place in the UK and this could well be an important time for the UK to maintain strong business relationships with Europe post Brexit. The CILA will therefore be at the heart of this.